Anti-GMO: You may believe humans should not tamper with evolution or you are deeply concerned with unforeseen environmental effects that GMOs may trigger. You are dubious about corporate intent to do good or you may have a religious opposition to tampering with God’s creatures. Irrespective of the reasons, you probably oppose genetic research even if it is deeply regulated. You will vote “Yes” on GMO labeling where you would demand companies declare GMO ingredients in food labels. Ideally though, you may support a complete ban on GMO in foods. Pro GMO & anti-labeling: You support genetic research and believe responsible and competent scientists are the ones controlling the process. You think the good it can do far outweighs the risks. You may believe the market must be allowed to prevail in this debate and not the regulators and that the environmentalists are habitually shrill and overstating risks. Consequently you think there is no need to legislate GMO labeling and consumers are not going to be better served by this bureaucracy. Pro GMO, but Pro-labeling: You perhaps believe genetic modification is almost evolutionary or that the GMO train has inexorably left the platform and there is no turning back. You might even support GMO in cash crops (Cotton, Tobacco etc.) provided there are substantial experimental controls on consequences. You may believe the standards for testing must be raised and include not just efficacy, clinical and safety trials but also a new level of environmental trials. You do not easily support genetic modification in food crops and hence will absolutely support GMO labeling in all food be it in retail packs or in food service establishments. GMO Fence sitter: Perhaps you are relatively new to the debate or have been overexposed but unconvinced by arguments on both sides. Perhaps your family is divided on the issue and you are the impartial referee, or equally likely you just don’t know enough and are smart enough not to make up your mind with half-truths. You may be pro- science & left-of-center or you are pro-environment but right of center. In this debate the fence appears to you the least prickly place for now. Partially developed by the International Rice Research Institute (IRRI) in Manila, Philippines Golden Rice is a genetically modified crop that has a gene from corn and (animal) bacterium embedded in a rice variety that helps produce beta carotene which is a precursor to Vitamin A in the human body. This is being paraded as a major breakthrough. Why? WHO claims, quarter to half a million children goes blind annually & half of them perish within a year of losing their sight due to Vitamin A deficiency. Now, you can see where this argument is headed. IRRI chief Mr. Robert Ziegler and the GMO lobby are full of righteous indignation that environmentalists and Governments should even oppose such a miracle as Golden Rice instead of rushing to restore the sights of millions of children around the world. No surprise, opponents of GMO are feeling a bit flat-footed. How do you oppose something like this without being labeled a child killer?! It appears the corporate ‘evil’ shoe is now on the other foot. Lets look at some facts on Golden Rice before we raise our voices from our respective four corners. It is now axiomatic that Vitamin A deficiency causes child blindness and that consuming Beta Carotene helps the body produce Vitamin A. 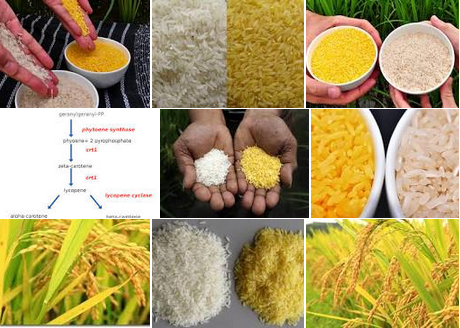 Golden Rice has been in development for more than 20 years and it does seem to have the extra beta-carotene that even lends it color to the grain making it golden instead of the characteristic white. The original developers and scientists working on Golden Rice were powered by a sense of greater good and they even mandated that the grain when fully developed and distributed to famers be on a not-for-profit basis. Field trials conducted across several countries did produce the beta- carotene but the affordability and yields are still not satisfactorily established. Governments in Japan, China, India and even the Philippines (where the rice was developed) are yet to authorize this GMO crop. It may appear Golden Rice is being touted for it potential more than for its performance and is clearly being defended even before its fully commercialized. Notwithstanding these hurdles, scientists will ultimately get it right and pressure on governments will only mount. But in this entire debate over the years, all of us have gotten so anchored in the GMO vs. non-GMO debate that the elephant in the room is no longer visible to us. Here is the big question that is not being asked. Can GMO Golden Rice really prevent child blindness? The unfortunate but practical answer is No. This was explained to me in a recent conversation I had recently with a pre-eminent doctor and national award winning eye specialist (who had not heard about Golden Rice!). He said that in his experience, he had seldom witnessed child blindness solely due to Vitamin A deficiency! Malnutrition and dehydration, he explained prevent Vitamin A absorption in the body and it is this lack of bioavailability of Vitamin A that triggers blindness. No amount of fortified rice will prevent blindness without first addressing the basic problems of nutrition and dehydration that plagues poor children in dozens of countries in Asia and Africa. This is akin to treating a symptom while ignoring the cause. Countries will need to continue work towards improving food security and ensure their children get the basic macro nutrients in the form of carbohydrates, fats and proteins and then travel through Maslow's hierarchy of micronutrients such as Vitamin A, Iron, Iodine etc. Whichever corner of the ring you now find yourself in, the fight on Golden Rice deserves to be taken to a different theater, free from the clutter and the noise of the GMO debates.